It’s More Than Just Noise That Triggers Your Dog’s Fear! We all love our dogs and hate to see them suffer in any way at anytime. But when it comes to really frightening things such as loud storms or fireworks, it really hurts to see our friends before us simply shivering in fear or panic and feel so helpless in not knowing what we can do to help calm their fears. Wouldn’t it be great if there were some things that we could really do? Dr. Kevin Fitzgerald with the American Kennel Club shares some of the latest research and findings in the article below. Some dogs demonstrate radical behavior in response to storms. 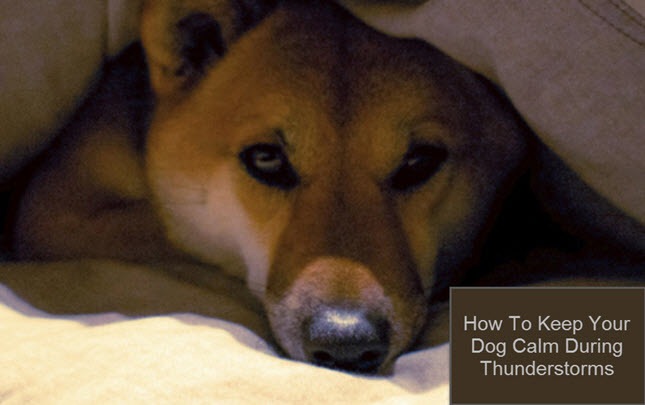 There are several measures you can take to calm your dog as lightning strikes and thunder claps. Some researchers believe it is more than simply the noise of the thunder that triggers their fear. Studies have shown that dogs may hear distant thunder claps of approaching storms long before we do, and they also may be able to smell the moisture of coming rain, maybe even sense static electricity generated by electrical storms, and feel changes in barometric pressure. It has long been thought that you can modify a dog’s behavior by doing pleasant things with him during the storm. In this way, the dog learns to associate storms with treats and time with his owner, substituting pleasant associations for scary ones. This can calm an animal, but is not always possible—thunderstorms can appear very quickly when the dog is alone and may be over before an owner can get home. Renowned animal-behavior expert Dr. Temple Grandin has written that some dogs may decrease stress through the application of deep pressure. It has been suggested that noise-phobic dogs can benefit from wearing a tight T-shirt, or from his owner swaddling the torso. The theory is that the pressure elicits a calming effect. Products that reduce static electricity have also been credited with lowering a dog’s anxiety during storms. Drugs have long been prescribed in response to storm and noise phobias. Talk to your veterinarian about drugs that have been successful for treating anxiety. Keep in mind, though, that storms can come out of nowhere and the drugs cannot always be given early enough to achieve effective blood levels before the storm is over. For some people, the only way to combat storm and noise problems is to confine their dog during storms to a room with no windows and to turn on the TV. The sound provides “white noise,” masking the booming outside, and a room with no windows shields the dog from lightning flashes. Talk to your veterinarian about ways to make your dog less fearful and more secure.